Meizu PRO 5 Ubuntu Edition is a powerful smartphone running Ubuntu based on Samsung Exynos 7420 octa-core processor, 3GB RAM and 32 GB internal store. However, the main disappointment at the time of the launch was that it did not feature any physical video output interface, so convergence (desktop mode) was not available at the time, but Canonical has now implemented wireless display support with OTA11, and the phone will switch to desktop mode when connected to a WiDi adapter. The latest Over-The-Air update has landed and this is a special one. We’ve introduced wireless display capabilities, which means that you can enjoy the full Ubuntu PC experience running from the latest Ubuntu smartphone, the Meizu Pro 5. 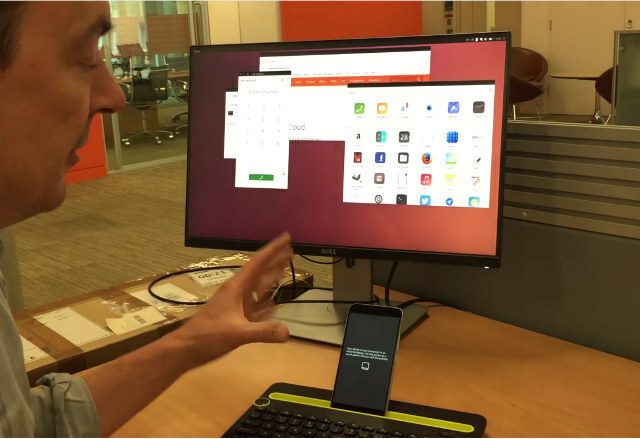 And the best bit is, it will be available for all future Ubuntu smartphone and tablet devices (with supporting hardware)! The Product Manager also shot a short video showing Meizu Pro 5 connecting to a wireless display dongle by Microsoft, maybe that one (TBC). This new feature might finally make the phone an attractive purchase for $370 considering it could become your main computer too. Where can I find a device which consists of a touchdisplay and a battery which connects wirelessly to this device? With such a setup, I don’t need two full-blown devices (a cell phone and a tablet), with double software setup/update overhead, I just have one OS/setup which I could use on the way or comfortably at home like a tablet. Am I the only one thinking that would be useful or such a device already exists and I missed it? In the demo, they have a “dumb” device (Wireless Displayer adapter) and a smartphone. @cnxsoft: I meant a dumb tablet (touchscreen + battery) which I could connect wirelessly to this phone. I don’t need a full-blown tablet with processor, flash, os, apps…, I just want a display which I can use with my cell phone wirelessly. Advantage: I have access to my already configured os + apps, data on my cell phone.